At the end of 1989, two years after we had started the highly controversial AIDS column in SPIN, we published an article by Celia Farber called “Sins of Omission” about the truly bad and corrupt science surrounding promoting AZT as a treatment for the syndrome of diseases. Celia was the editor and frequent writer of the column and unearthed hard evidence of the cold-bloodedness of the AIDS establishment pushing a drug that was worse than the disease, and killed faster than the natural progression of AIDS left untreated. AZT had been an abandoned cancer drug, discarded because of it’s fatal toxicity, resurrected in the cynical belief that AIDS patients were going to die anyway, so trying it out was sort of like playing with the house’s money. Because the drug didn’t require the usual massively expensive research and trial processes, having gone through that years earlier, it was insanely profitable for its maker, Burroughs Wellcome. It was a tragically perfect storm of windfall profits, something to pacify AIDS activists and the media, and a convenient boom to the patent holders for HIV testing. Celia — who should get the Congressional Medal of Honor for her brave and relentless reporting, here and throughout the ten years we ran the column — exposed the worthlessness of the drug, the shady studies and deals to suppress the negative findings, and its awful and final consequences. This piece very literally changed the media’s view of AIDS and sharpened their discerning and skeptical eye. And soon after, AZT was once again shelved, hopefully this time forever. Many times over the years since, people have come up to me and said that reading this article saved their lives, that they either stopped taking the drug and their health improved vastly, or they never took it because of what we reported. Nothing ever made me prouder. On a cold January day in 1987, inside one of the brightly-lit meeting rooms of the monstrous FDA building, a panel of 11 top AIDS doctors pondered a very difficult decision. They had been asked by the FDA to consider giving lightning-quick approval to a highly toxic drug about which there was very little information. Clinically called Zidovudine, but nicknamed AZT after its components, the drug was said to have shown a dramatic effect on the survival of AIDS patients. The study that had brought the panel together had set the medical community abuzz. It was the first flicker of hope — people were dying much faster on the placebo than on the drug. But there were tremendous concerns about the new drug. It had actually been developed a quarter of a century earlier as a cancer chemotherapy, but was shelved and forgotten because it was so toxic, very expensive to produce, and totally ineffective against cancer. Powerful, but unspecific, the drug was not selective in its cell destruction. “I agree with you,” answered another panel member, “there are so many unknowns. Once a drug is approved, there is no telling how it could be abused. There’s no going back.” Burroughs Wellcome reassured the panel that they would provide detailed two-year follow-up data, and that they would not let the drug get out of its intended parameters: as a stopgap measure for very sick patients. Dr. Brook was not won over by the promise. “If we approve it today, there will not be much data. There will be a promise of data,” he predicted, “but then the production of data will be hampered.” Brook’s vote was the only one cast against approval. Brad Stone, FDA press officer, was at that meeting. He says he doesn’t recall that particular speech, but that there is nothing “unusual” about FDA officials making such speeches at advisory meetings. “There was no political pressure,” he says. “The people in that meeting approved the drug because the data the company had produced proved it was prolonging life. Sure it was toxic, but they concluded that the benefits clearly outweighed the risks.” The meeting ended. AZT, which several members of the panel still felt uncomfortable with and feared could be a time bomb, was approved. Flash forward: August 17, 1989. Newspapers across America banner-headlined that AZT had been “proven to be effective in HIV antibody-positive, asymptomatic, and early ARC patients,” even though one of the panel’s main concerns was that the drug should only be used in a last-case scenario for critically-ill AIDS patients, due to the drug’s extreme toxicity. Dr. Anthony Fauci, head of the National Institutes of Health (NIH), was now pushing to expand prescription. The FDA’s traditional concern had been thrown to the wind. Already the drug had spread to 60 countries and an estimated 20,000 people. Not only had no new evidence allayed the initial concerns of the panel, but the follow-up data, as Dr. Brook predicted, had fallen by the wayside. The beneficial effects of the drug had proven to be temporary. The toxicity, however, stayed the same. 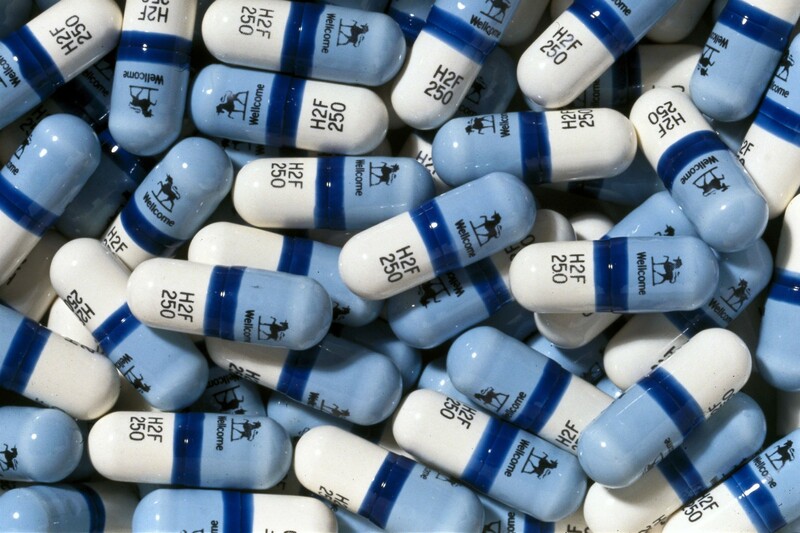 The majority of those in the AIDS-afflicted and medical communities held the drug up as the first breakthrough on AIDS. For better or worse, AZT had been approved faster than any drug in FDA history, and activists considered it a victory. The price paid for the victory, however, was that almost all government drug trials, from then on, focused on AZT — while over 100 other promising drugs were left uninvestigated. Burroughs Wellcome stock went through the roof when the announcement was made. At a price of $8.000 per patient per year (not including blood-work and transfusions), AZT is the most expensive drug ever marketed. Burroughs Wellcome’s gross profits for next year are estimated at $230 million. Stock market analysts predict that Burroughs Wellcome may be selling as much as $2 billion worth of AZT, under the brand name Retrovir, each year by the mid-1990s — matching Burroughs Wellcome’s total sales for all its products last year. AZT is the only antiretroviral drug that has received FDA approval for treatment of AIDS since the epidemic began ten years ago, and the decision to approve it was based on a single study that has long been declared invalid. The study was intended to be a “double-blind placebo-controlled study,” the only kind of study that can effectively prove whether or not a drug works. In such a study, neither patient nor doctor is supposed to know if the patient is getting the drug or a placebo. In the case of AZT, the study became unblinded on all sides, after just a few weeks. Both sides contributed to the unblinding. It became obvious to doctors who was getting what because AZT causes such severe side effects that AIDS per se does not. Furthermore, a routine blood count known as a CMV, which clearly shows who is on the drug and who is not, wasn’t whited out in the reports. Both of these facts were accepted and confirmed by both the FDA and Burroughs Wellcome, who conducted the study. Many of the patients who were in the trial admitted that they had analyzed their capsules to find out whether they were getting the drug. If they weren’t, some bought the drug on the underground market. Also, the pills were supposed to be indistinguishable by taste, but they were not. Although this was corrected early on, the damage was already done. There were also reports that patients were pooling pills out of solidarity to each other. The study was so severely flawed that its conclusions must be considered, by the most basic scientific standards, unproven. The most serious problem with the original study, however, is that it was never completed. Seventeen weeks into the study, when more patients had died in the placebo group, the study was stopped, five months prematurely, for “ethical” reasons: It was considered unethical to keep giving people a placebo when the drug might keep them alive longer. Because the study was stopped short, and all subjects were put on AZT, no scientific study can ever be conducted to prove unequivocally whether AZT does prolong life. Brook pointed out that since the drug is a form of chemotherapy, it should only be prescribed by doctors who have experience with chemotherapeutic drugs. Because of the most severe toxic effect of AZT — cell depletion of the bone marrow —patients would need frequent blood transfusions. As it happened, AZT was rampantly prescribed as soon as it was released, way beyond its purported parameters. The worst-case scenario had come true: Doctors interviewed by the New York Times later in 1987 revealed that they were already giving AZT to healthy people who had tested positive for antibodies to HIV. The FDA’s function is to weigh a drug’s efficacy against its potential hazards. The equation is simple and obvious: A drug must unquestionably repair more than it damages, otherwise the drug itself may cause more harm than the disease it is supposed to fight. Exactly what many doctors and scientists fear is happening with AZT. AZT was singled out among hundreds of compounds when Dr. Sam Broder, the head of the National Cancer Institute (NCI), found that it “inhibited HIV viral replication in vitro.” AIDS is considered a condition of immune suppression caused by the HIV virus replicating and eating its way into T-4 cells, which are essential to the immune system. HIV is a retrovirus which contains an enzyme called reverse transcriptase that converts viral RNA to DNA. AZT was thought to work by interrupting this DNA synthesis, thus stopping further replication of the virus. In the study that won FDA approval for AZT, the one fact that swayed the panel of judges was that the AZT group outlived the placebo group by what appeared to be a landslide. The ace card of the study, the one that canceled out the issue of the drug’s enormous toxicity, was that 19 persons had died in the placebo group and only one in the AZT group. The AZT recipients were also showing a lower incidence of opportunistic infections. Bialy, who is also a molecular biologist, is horrified by the widespread use of AZT, not just because it is toxic, but because, he insists, the claims its widespread use are based upon are false. “I can’t see how this drug could be doing anything other than making people very sick,” he says. The scientific facts about AZT and AIDS are indeed astonishing. Most ironically, the drug has been found to accelerate the very process it was said to prevent: the loss of T-4 cells. When promoters of AZT are pressed on key scientific points, whether at the NIH, FDA, Burroughs Wellcome, or an AIDS organization, they often become angry. The idea that the drug is “doing something,” even though this is invariably followed with irritable admissions that there are “mechanisms about the drug and disease we don’t understand,” is desperately clung to. It is as if, in the eye of the AIDS storm, the official, government-agency sanctioned position is immunized against critique. Skepticism and challenge, so essential to scientific progress and so prevalent in every other area of scientific endeavor, is not welcome in the AZT debate, where it is arguably needed more than anywhere else. The results, finally and ironically, are what damns AZT. The toxic effects of AZT, particularly bone marrow suppression and anemia, are so severe that up to 50 percent of all AIDS and ARC patients cannot tolerate it and have to be taken off it. In the approval letter that Burroughs Wellcome sent to the FDA, all of 50 additional side effects of AZT, aside from the most common ones, were listed. These included: loss of mental acuity, muscle spasms, rectal bleeding, and tremors. This argument betrays a bizarre reasoning. If AIDS patients are already burdened with problems such as immune suppression, bone marrow toxicity, and anemia, is compounding these problems an improvement? HIV levels in the blood are measured by an antigen called p24. Burroughs Wellcome made the claim that AZT lowered this level, that is, lowered the amount of HIV in the blood. At the first FDA meeting, Burroughs-Welcome emphasized how the drug had “lowered” the p24 levels; at the follow-up meeting they didn’t even mention it. Dr. Lange suggested that the drug may be effective in the same way a simple anti-inflammatory, such as aspirin, is effective. An inexpensive, nontoxic drug called Indomecithin, he pointed out, might serve the same function, without the devastating side effects. “I am absolutely convinced that people enjoy a better quality of life and survive longer who do not take AZT,” says Gene Fedorko, President of Health Education AIDS Liaison (HEAL). “I think it’s horrible the way people are bullied by their doctors to take this drug. We get people coming to us shaking and crying because their doctors said they’ll die if they don’t take AZT. That is an absolute lie.” Fedorko has drawn his conclusion from years of listening to the stories of people struggling to survive AIDS at HEAL’s weekly support group. The last surviving patient from the original AZT trial, according Burroughs Wellcome, died recently. When he died, he had been on AZT for three and one-half years. He was the longest surviving AZT recipient. The longest surviving AIDS patient overall, not on AZT, has lived for eight and one-half years. An informal study of long-term survivors of AIDS followed 24 long-term survivors, all of whom had survived AIDS for more than six years. Only one of them had recently begun taking AZT. In the early days, AZT was said to extend lives. In actual fact, there is simply no solid evidence that AZT prolongs life. “Whether you live or die with AIDS is a function of how well your doctor treats you, not of AZT,” says Dr. Joseph Sonnabend, one of New York City’s first and most reputable AIDS doctors, whose patients include many long-term survivors, although he has never prescribed AZT. Sonnabend was one of the first to make the simple observation that AIDS patients should be treated for their diseases, not just for their HIV infection. August 17, 1989: The government has announced that 1.4 million healthy, HIV antibody-positive Americans could “benefit” from taking AZT, even though they show no symptoms of disease. New studies have “proven” that AZT is effective in stopping the progression of AIDS in asymptomatic and early ARC cases. Dr. Fauci, the head of NIH, proudly announced that a trial has been going on for “two years” had “clearly shown” that early intervention will keep AIDS at bay. Anyone who has antibodies to HIV and less than 500 T-4 cells should start taking AZT at once, he said. That is approximately 650,000 people. 1.4 million Americans are assumed HIV antibody-positive, and eventually all of them may need to take AZT so they don’t get sick, Fauci contended. We asked a few questions about the numbers. According to the press release, 3,200 early ARC and asymptomatic patients were divided into two groups, one AZT and one placebo, and followed for two years. The two groups were distinguished by T-4 cell counts; one group had less than 500, the other more than 500. These two were then divided into three groups each: high-dose AZT, low-dose AZT, and placebo. In the group with more than 500 T-4 cells, AZT had no effect. In the other group, it was concluded that low-dose AZT was the most effective, followed by high-dose. All in all, 36 out of 900 developed AIDS in the two AZT groups combined, and 38 out of 450 in the placebo group. “HIV-positive are twice as likely to get AIDS if they don’t take AZT,” the press declared. However, the figures are vastly misleading. When we asked how many patients were actually enrolled for a full two years, the NIH said they did not know, but that the average time of participation was one year, not two. The study boasted that AZT is much more effective and less toxic at one-third the dosage than has been used for three years now. That’s the good news. The bad news is that thousands have already been walloped with 1,500 milligrams of AZT and possibly even died of toxic poisoning — and now we’re hearing that one third of the dose would have done? With all that remains so uncertain about the effects of AZT, it seems criminal to advocate expanding its usage to healthy people, particularly since only a minuscule percentage of the HIV-infected population have actually developed ARC or AIDS. “Thus the benefits of AZT are limited to a few months for ARC and AIDS patients,” the French team concluded. After a few months, the study found, AZT was completely ineffective. * = This sentence was changed to correct an error in the original version of this article, which wrongly stated that the FDA had approved Thalidomide.